Several years ago I was chatting to the manager in my local large supermarket about the very emotional issue (if you are a coeliac) of gluten free bread, and he said, “Oh yes, I know it must be terribly hard for you celeriacs”. I didn’t have the heart to correct him as he looked so earnest, but have to say that as the years have gone by, the understanding of coeliac disease (hard enough to spell, let alone live with) and the offending protein, gluten, has improved hugely. Gluten free (gf) foods are now readily available here in the UK and many restaurants have menus which are fully labelled, taking the stress out of eating out. I was out for lunch recently here in Hertfordshire though and the waitress gleefully told me she would bring me the Allergy Information Pack which turned out to be a 100 paged, closely- typed scientific report which I then had to cross-reference against the menu. Jolly helpful you might think, but by the time I had found things I liked the sound of, checked whether the tick meant it was gf or contained gluten, and finally checked if it was on that day’s lunch menu, I had lost my appetite and was stressed by the whole palaver, as was Mr Bee. All coeliacs will know this problem well. Worse though is the waiter who says, “Yes I am sure that will be fine” but comes back 10 minutes later with the type of comment which makes a coeliac shudder: “the risotto contains rice, so you can’t have that”. If that is the level of their knowledge, cast aside your napkin and RUN. 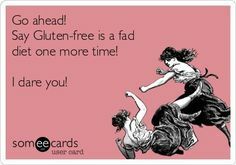 Some very lovely people I know eat a gluten free and/or wheat free diet for health reasons, even though they may not technically have this auto-immune disease (or at least have not been diagnosed). I vividly remember one waitress in a restaurant literally rolling her eyes when I told her I couldn’t have gluten (another picky eater) so I do sometimes feel like wearing a little badge which says ” REAL Coeliac” and I always, without fail now refer to it as “Coeliac Disease” when talking to people in a restaurant, cafe or shop. There does seem to be good evidence now of what is called ‘Non-Coeliac Gluten Sensitivity’ (NCGS) so we RCs (Real Coeliacs) need to embrace our brothers and sisters. The more the merrier. There are so many lovely blogs, websites and books for coeliacs now. When you are at home, you can eat like a king. Travelling abroad has its challenges but you can print off information about the disease in loads of languages these days which at least cuts down on the chances of mistakes being made. It is no picnic being coeliac, but there are MUCH worse problems to have. The Making of the White Garden ~ 3. Which Plants Where?